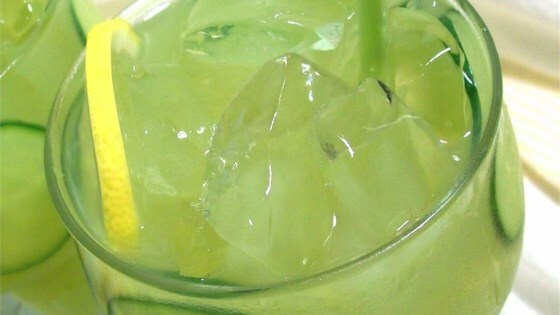 "Cucumber is the perfect complement to the traditional summer lemonade. Display it in the pitcher with cucumber and/or lemon slices." Make a simple syrup by stirring the water and sugar together in a saucepan over medium heat; heat until just about to boil and the sugar has dissolved. Place in refrigerator 30 minutes, or until cool. Place the cucumber slices in a blender or food processor; blend until mashed into a pulp. Pour the cucumber pulp into a fine mesh strainer place over a bowl to catch the liquid; allow to sit until you have about 2/3 cup of liquid from the cucumber, about 15 minutes. Stir the simple syrup, cucumber liquid, and lemon juice together in a pitcher. Serve cold. This lemonade is delicious. It was a little strong and sweet for me, so I added water and ice to it, but very easy to adjust to taste. Thanks for the recipe!